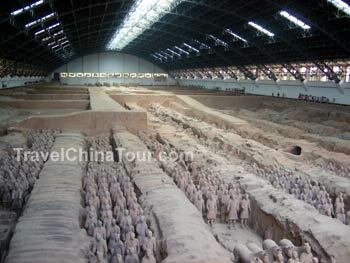 After visiting the Mausoleum of Emperor Qin ShiHuang, I headed to the Terra Cotta army pits. At the parking lot where tourists get dropped off, there is still some ways before you reach the actual museum. Front Entrance of the Terra Cotta army museum. 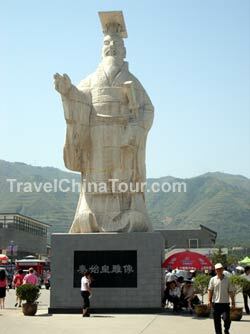 At the front entrance, there's a huge statue of Emperor Qin ShiHuang. A little futher past the parking lots, is the shuttle service that takes you to the main entrance of the museum. Walking will take about 15 mintues or so, and taking the shuttle cart took under 5 minutes. They charge $4 yuan for a one way trip, or $5 yuan for a round trip. The shuttle bus drops you off a few feet away from the ticket booth, during peak season, you can expect to wait in line to buy tickets, which costs $90 yuan (~$12USD). 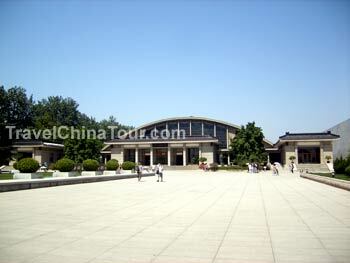 The Terra Cotta museum was opened to the public in 1979, and is one of the largest on-site museums in the world. 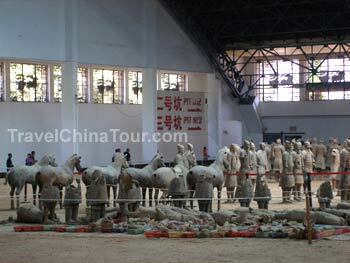 There are 3 Terra Cotta army pits that contain warrior soldiers and horses. Besides these 3 exhibit pits, another hall was built to display the bronze chariots, horses, and thousands of other relics uncovered. There are roughly 8,000 terra cotta soldiers, horses, and bronze weapons discovered on the site. Standing at the entrance, facing Pit #1. Terra cotta pit #1 is by far the largest pit of the 3 discovered. It measures 230 meters long and 62 meters wide. About 6,000 terra cotta warriors and horses are unearthed from this pit. Originally, I didn't think much of the terra cotta museum, until I entered the first pit... It was absolutely stunning. I've never been here before, and what little I knew about the terra cota army, I learned from pictures and reading. But reading about it, and seeing it in photos just doesn't do it justice. I was completed awed by the sight before me. All the clay statues are all life sized statues, all exquisitely made. Each terra cotta solider has different facial features and expressions. It's like looking at a massive, organized, very real army lined up infront of you, that's ready to go into battle. Walking along the left side, I came to the back end of pit #1. Here, it's a large open area, that's rather empty, and it appears, this is where newly excavated terra cotta soldiers and horses are put together piece by piece. If you look at the photo above, there is a large pile of rubble in the front, which are broken terra cotta soldiers and horses, unfortunately. Going around directly to the back, you will be able to see that these soldiers and horses here have cracks and holes, and it's apparent that all these solders were put back together piece by piece.